Respite provides caregivers of those with long term or lifelong disabilities an opportunity to have some time away from their caregiving duties. A respite break can be as short as a few hours or as long as a couple of days or weeks. The Panhandle Partnership Respite Program is one of six Nebraska Respite Network Sites. The Respite Network offers information & referral services for families & potential or current respite providers. Call your local coordinator at 308.432.8190. REMEMBER TO TAKE CARE OF YOURSELF SO YOU CAN BETTER TAKE CARE OF OTHERS! Nebraska Respite Network connects overwhelmed caregivers with information about appropriate respite services in their local area. Provides information for respite providers who wish to be registered & offer services. 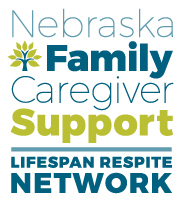 Nebraska Respite Network assists with names & phone numbers of respite services connecting caregivers, providers & volunteers. To access respite resources day or night, click here. Personal sorties have great power. They help create a shared understanding of who we are and how we live our lives. They help us celebrate our successes and document our challenges. Stories bring policies to life. Respite Funding to help support family members who provide assistance or support to loved ones with special needs is currently under threat. The NE Lifespan Respite Network is collecting stories to share with policy makers. Help us put a face on the issue and tell lawmakers about the devastating implications if respite funding is cut. Tell us your story of how respite has helped your family. Respite FUN days are currently held once a year for children who have disabilities and their siblings. We have lots of fun while parents get a short break! Did you know there are over 200,000 caregivers in Nebraska? How many of your employees are caregivers? How could employers offer support to caregivers? Family caregivers play a critical role in supporting individuals who need long-term services and supports. Respite provides an opportunity for family caregivers of individuals with disabilities, chronic health conditions or who are aging to take a much-needed break to care for themselves. Research shows that when family caregivers make time for themselves, they are better caregivers and continue in the caregiving role. As the baby-boomer population ages, employers will see an impact of caregivers who are not able to stay in the work-force due to caregiving responsibilities. Assisting your employees in finding Respite to get a break from caregiving, may enable them to live a more balanced life and be focused and reliable employees.